The Blue Jays were a distant fourth in the American League East this year, finishing 17 games behind the third-place Rays, but the organization intends to compete with the division powerhouses in 2019. And that's because Toronto possesses the game's top talent in Vladimir Guerrero Jr. as well as three others among MLB.com's Top 100 Prospects -- Bo Bichette (11), Danny Jansen (65) and Nate Pearson (90). And it isn't just players at the upper Minor League levels turning heads. Toronto's system is peppered with talent from top to bottom. The organization had two teams qualify for the postseason -- Rookie-level Bluefield in the Appalachian League and Double-A New Hampshire in the Eastern League. Bluefield went the distance in the semifinals but was knocked out by Princeton. New Hampshire flexed its muscle with a perfect 6-0 run through the postseason to claim the EL title. The Fisher Cats outscored their opponents 40-12 in that stretch, and several members of that squad appear on this list and will be making a strong case for a shot in The Show next year. Catcher -- Danny Jansen, Buffalo (88 games), Toronto (31 games): After a breakout campaign in 2017, Toronto's third-ranked prospect picked up where he left off to make his second straight appearance as an Organization All-Star. The 23-year-old ended last year with a strong 21-game stretch at Triple-A Buffalo and he continued to rake through the first 88 games of the International League season, clubbing a career-best 12 homers and plating 58 runs. That performance earned the 2013 16th-rounder a promotion to the bigs, where he made his debut on Aug. 13. Jansen went 20-for-81 with nine extra-base hits down the stretch. The Appleton [Wisconsin] West High School product also made his first Futures Game appearance in Washington D.C. in July. "Danny is just one of the strongest competitors with probably the best work ethic and makeup we have in the entire system," said Blue Jays director of player development Gil Kim. "He's made a ton of progress both offensively and defensively over the last three years and it was great to see him get his opportunity in the bigs this year. Off the field, he's a strong worker and leader, and on the field he's a reliable catcher. Pitchers love throwing to him. And offensively, he can control the strike zone and has shown some raw power too." Honorable mention, Alejandro Kirk, Bluefield (58 games): After being signed as an international free agent out of Mexico and appearing in one Gulf Coast League game last year, Kirk returned this season with a clean bill of health and hit .354/.443/.558 while smashing 10 dingers with 57 RBIs. First baseman -- Chad Spanberger, Asheville (92 games), Lansing (nine games), Dunedin (22 games): Acquired by Toronto on July 26 from Colorado, Spanberger transitioned seamlessly to the Blue Jays system in the midst of an impressive sophomore professional season. Upon arriving in the Class A Midwest League, the 23-year-old collected seven hits -- including a homer and a triple -- over his first four games. In just over a week, he earned a promotion to the Class A Advanced Florida State League, where he finished 18-for-78 with three long balls in 22 games. "It was great to see Chad's progress with us throughout the last month of the season," Kim said. "He possesses a difference-making tool in his raw power. He impacts the ball as loud as anyone in our system. Right now, it's about becoming more consistent with his approach at the plate, but he's a hard worker and we're excited about him." Honorable mention, Ryan Noda, Lansing (124 games): The No. 30 Blue Jays prospect, an Organization All-Star last year, led the Minor Leagues with 109 walks despite struggling to hit for the first several weeks of the season. The 22-year-old -- who showed versatility by appearing in 57 games in the outfield -- got more balls to fall in during the second half. Noda was hitting .179 on May 17 and finished the year with a .256 average. Second baseman -- Cavan Biggio, New Hampshire (132 games): The bat that the Blue Jays thought they were getting when they drafted Biggio in the fifth round two years ago was on full display this season. The organization's No. 9 prospect led the EL with 26 home runs, a .499 slugging percentage and 100 walks. The 23-year-old's 99 RBIs, 54 extra-base hits and 80 runs scored ranked second on the circuit, while his .388 on-base percentage was third in the league -- three points behind leader Levi Michael of Binghamton. The Notre Dame product was also named the Most Valuable Player and Rookie of the Year of the EL, and he earned Arizona Fall League Rising Star honors. "Cavan is just a very intelligent player. He's got incredible instincts for the game," Kim said. "He has a very good ability to make adjustments on his own, which speaks to his feel and experience of the game. He made a swing adjustment, which allowed the bat to stay through the zone longer, and that led to a very successful performance with New Hampshire. He also stepped up and was one of the leaders of that team." 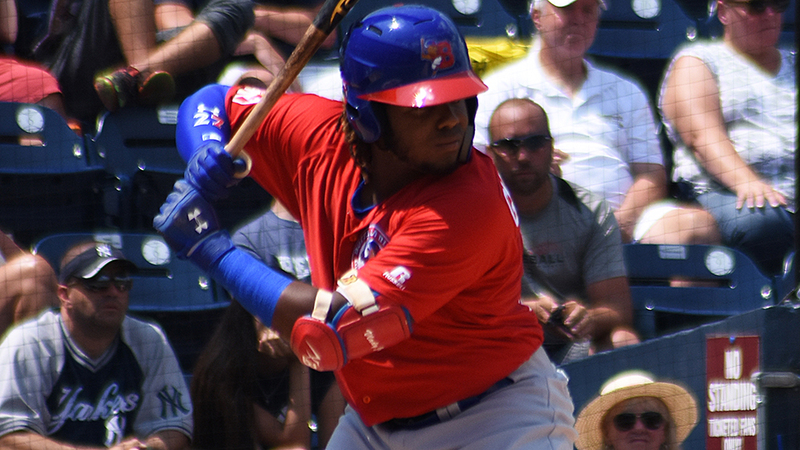 Third baseman -- Vladimir Guerrero Jr., GCL Blue Jays (three games), Dunedin (one game) New Hampshire (61 games), Buffalo (30 games): There isn't much to write about Guerrero that hasn't already been written. The game's top prospect was a shocking omission from Toronto's September callups as he proved again that he is a force to be reckoned with at the plate. The 19-year-old finished the year with a .381/.437/.636 slash line, a career-best 20 dingers and 78 RBIs, and he kept an even keel despite missing about a month with a left knee injury. This is his third consecutive time as an Organization All-Star. "Yes, he had a standout year offensively, but what we're most excited about with Vlad is the progress he made on the defensive side of things," Kim said. "First-step quickness and technical footwork were main areas of focus for him this year and he really improved on both of them. I actually think the rehab stint [in the GCL and FSL] was good for him because it allowed him to work on maximizing his athleticism, which you need to be a big league third baseman, and he did just that. We're really excited about what's next for him in 2019." Shortstop -- Bo Bichette, New Hampshire (131 games): Baseball's No. 11 overall prospect continued his torrid run through the Minor Leagues, leading the EL in hits (154), doubles (43), extra-base hits (61), runs scored (95) and total bases (244). The 20-year-old's 32 steals were second. Bichette made his second Futures Game appearance, and this is his second straight year as an Organization All-Star. "Bo is one of the most intense competitors we have. He just has this fire at the plate, where he definitely just wants to beat you," Kim said. "One of his best strengths offensively is his aggressiveness, and he combines that with excellent bat speed, outstanding hand-eye, and a mature approach at the plate. So, he was challenged this year at Double-A and he worked through it and put together a very good season offensively. However, like Vlad, we were really excited with his defensive improvements. We put an emphasis on improving his footwork and backhand play, and he showed great progress in both." Rodrigo Orozco, Dunedin (112 games): Coming off his first full season with Lansing, the 23-year-old finished the season tied with teammate Ivan Castillo for the best average in the FSL (.304). He also posted career-highs in hits (115), RBIs (39), doubles (23), triples (three), extra-base hits (27) and runs (70). The native of Panama displayed outstanding zone awareness, whiffing 53 times in 418 plate appearances. "He's just a ball player," Kim said. "He's got the ability to get the barrel to the ball and he can put it in play anywhere. He's versatile defensively, and he's a very hard worker. He put together a great season for us." Brock Lundquist, Lansing (70 games), Dunedin (49 games): In his first full season, Lundquist hammered his way to the Class A Advanced level by July 3. After the bump, the 22-year-old hit .337/.401/.483 with 16 extra-base hits and 26 runs scored in 49 games. He finished the year with 18 dingers, 74 RBIs and 55 runs scored. "Brock is an aggressive hitter who can really put a charge in the ball," Kim said. "He earned that midseason promotion and then rose to the challenge. We were all pretty happy with how he progressed throughout the course of this year." Cal Stevenson, GCL (six games), Bluefield (53 games): Stevenson was taken in the 10th round of the Draft out of the University of Arizona and opened eyes at the Rookie-level. The 22-year-old posted a .369/.511/.523 slash line with 31 RBIs and 73 runs scored over 59 games. He also swiped 21 bags in 22 attempts. Stevenson was named an Appalachian League post-season All-Star. "Cal quickly became one of [Bluefield manager] Dennis Holmberg's favorites," Kim said. "He's a smart player, a very skilled, alert, aggressive base runner and a solid defensive outfielder. He always gets a good read off the bat, and he is one of the strongest players in our whole system when it comes to baserunning and defense. He's also got great awareness and control at the plate. It was a nice pickup by our scouting department to recognize someone who can play the game as well as he can." Honorable mention, Harold Ramirez, New Hampshire (120 games): The 24-year-old posted a .320/.365/.471 slash line with 48 extra-base hits (including 11 homers) and 70 RBIs and also earned post-season All-Star and playoffs Most Valuable Player honors in the EL. Ramirez became a free agent in November and signed with the Marlins on Dec. 3. Utility -- Kevin Smith, Lansing (46 games), Dunedin (83 games): The power potential that made Smith a fourth-round selection in last year's Draft out of the University of Maryland surfaced this season. After connecting for seven home runs in the Midwest League, the 22-year-old mashed 18 dingers and drove in 49 runs over 83 FSL games. Toronto's No. 6 prospect finished the year hitting .302 with 25 roundtrippers, 93 RBIs and 93 runs scored. Smith also showed versatility in the field as he appeared in 13 games at second, 27 at third and 87 at short. "Kevin is a very intelligent player," Kim said. "He's very meticulous in the way he goes about his work, and he actually worked through a small swing adjustment and that helped him put together a solid offensive season. In the field, he's one of our most accurate throwers. …You can see how focused and detailed he is in his work. He's one of those guys that makes the players around him better and really just makes our organization as a whole better with his leadership and work ethic." Right-handed starter -- Patrick Murphy, Dunedin (26 starts), New Hampshire (one start): After battling through injuries the last couple of years, the 23-year-old posted a 10-5 record with a 2.64 ERA in the FSL. Murphy fanned 135 and walked 50 over 146 2/3 innings pitched in that stretch, and he also made a spot-start for New Hampshire against Hartford on May 27, allowing a pair of runs on four hits and three walks while fanning six over six frames. "He's our thoroughbred," said Blue Jays pitching coordinator Jeff Ware. "The velocity he has is well above average, and he's got a changeup to go along with it. He's really matured this year. Being named the Pitcher of Year in the Florida State League was such a great accomplishment for him as well, especially with the injuries he's had since we drafted him. He works as hard as anyone, and we were really proud of him. He made a ton of strides this year and, hopefully, he'll be a big leaguer soon with the Blue Jays organization." Left-handed starter -- Zach Logue, Lansing (nine starts), Dunedin (18 games, 16 starts): Logue continued his ascension through the Blue Jays system in his second season. The 2017 ninth-rounder out of the University of Kentucky posted a 2.67 ERA and 1.13 WHIP in nine starts with Lansing before being promoted to Class A Advanced Dunedin on May 25. He finished the year with a combined 3.15 ERA and 129 punchouts to 34 walks over 154 1/3 frames. "Logue has just done a tremendous job for us since we drafted him," Ware said. "He's not a guy who is going to overpower you, but he will beat you with finesse and deception. He's got a couple of different breaking balls, he can elevate up in zone with the fastball and he can move the ball in and out. It makes him a pitcher with Major League potential. He's also got a good heartbeat out on the mound; nothing bothers him. He's a great teammate, and his work ethic is off the charts." Relief pitcher -- Travis Bergen, Dunedin (16 games), New Hampshire (27 games): Bergen had one of those seasons that dreams are made of. The southpaw was off to an impressive start, posting a 1.71 ERA and 1.05 WHIP in 16 games with Dunedin, but after a promotion to New Hampshire the 25-year-old made those numbers look pedestrian. Bergen amassed a 0.95 ERA and 0.98 WHIP with 43 strikeouts and nine walks while holding opponents to a .195 average in 27 EL games (35 2/3 innings pitched). On Dec. 13, Bergen was selected by the Giants in the Rule 5 Draft. "To see Travis go so quickly after the year he had was disappointing. We just couldn't protect him," Ware said. "He showed tremendous poise, his work ethic was phenomenal and he really led by example. He showed great fastball command, had good hop on the ball and really spins his breaking ball well. The guy was a hidden gem for us who really put together a breakout year and it's sad to see him go." Honorable mention, Jake Fishman, Dunedin (44 games), Buffalo (one game): After appearing in 26 games over his first two professional seasons, the 23-year-old made 46 appearances this year and whiffed 57 while walking 11 over 58 1/3 frames with a 2.62 ERA. Ware described Fishman as "the kind of pitcher that gives lefties nightmares at the dish."